Tatabai is track 5 on a Bit na Ta; an album that is the culmination, so far, of a deep friendship between Melbourne composer-producer David Bridie and Tolai superstar George Telek. Their 30-year collaboration bore first fruit when David's band, Not Drowning Waving, went to Rabaul to make Tabaran, the landmark "world music" album acclaimed by David Byrne and Peter Gabriel in the early 1990s. a Bit na Ta flew to the No.9 spot on the Transglobal World Music Chart upon its release earlier this year, was selected to appear on the annual ‘Top of the World’ album compilation released by Songlines Magazine UK. In this same edition it received a 5 star review. Locally it’s been selected by leading world music journalist Seth Jordan as his pick of ‘Best Album’ in the annual Rhythms Magazine Writers Poll and has received a plethora of positive reviews by our top Senior music writers nationally. The audio/visual Art Installation that is accompanied by this album of music is travelling the country and currently shows at Victoria Museum until February 4th 2018. It will simultaneously show at the Kaohsiung Museum of Fine Arts in Taiwan between 7th Oct - 20th Feb 2018. 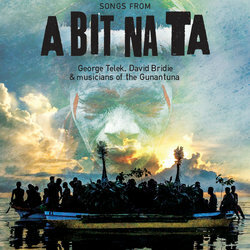 George Telek sings this glorious song,”Tatabai" off the a Bit na Ta album and art installation. The song celebrates Rabaul village life. food, family and the cycle of life. A luscious song Tatabai is a collaboration between George Telek and David Bridie and features the guitar work of John Phillips.